Idriz Ethemi, who has lived with type 2 diabetes for over 10 years. On 7 April 2016, WHO marks World Health Day, with a focus on "beating diabetes". In the WHO European Region, an estimated 64 million people live with diabetes. Here is the story of one of these people. For Idriz Ethemi, living with type 2 diabetes has become just another part of his life, something that he accepts as "normal" and manageable. But he did not always feel this way. 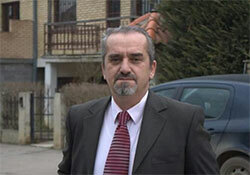 Ethemi, 56, is an economist who lives in Peja, Kosovo (in accordance with UN Security Council Resolution 1244 (1999)). His initial diagnosis in 2003 followed another serious health challenge – a heart attack that led to by-pass surgery. He knew he was experiencing the early symptoms of diabetes, such as extreme fatigue and constant thirst, but it was difficult for him to accept the news that he had yet another health problem. With the help of his wife and his four daughters, he gradually came to accept his diagnosis. He also had friends who were already living with the disease, and they played an instrumental role in assuring him that diabetes could be successfully managed with the proper treatment and by making certain changes to his lifestyle. His consultations with doctors and health workers further helped to ease his fears and allowed him to accept his "new normal" as a person living with diabetes. One of the early steps Ethemi took to improve his health after his heart attack and diabetes diagnosis was to quit smoking. When he quit in 2003, he had been smoking for nearly three decades. But this was not the only major change he had to make. At the outset, one of the most difficult changes for Ethemi was adjusting to a healthier diet. He could no longer eat whatever he wanted. While he was used to eating cakes, chocolates, white bread and virtually any food he liked, he now had to be much more careful. Today, he tries to eat more fruit and vegetables, foods rich in fibre and healthier protein sources, such as chicken and fish. After his diagnosis, he also began making physical activity a greater part of his routine. He now takes a 45-minute daily walk in the mountains near his home in Peja, along a path that is appropriately called the "Health Road". Ethemi also cooperates closely with his doctor to ensure that his insulin treatment proceeds smoothly. In the years since his diagnosis, Ethemi has also made it a priority to help others with diabetes. He recalls that he and his family turned primarily to the Internet for information about the disease after the diagnosis. At that time, only a few years after the conflict in the Balkans, it was difficult to find comprehensive medical information in Kosovo, so Ethemi felt that he had no choice but to find other ways to educate himself about diabetes. Years later, knowing how important it is for newly diagnosed patients to receive good, reliable information and training on the disease, Ethemi worked with his doctor and a diabetes non-profit organization to establish the National Diabetes Association, to improve diabetes advocacy in Kosovo. The Association helped open an advice centre, where people living with diabetes can get information and training on its management. Ethemi and his colleagues at the Association also lead activities to mark annual World Diabetes Day on 14 November. For Ethemi, it is important to help other people living with diabetes who might not have enough information or might not know how best to manage the disease. Today, more than a decade after his own diagnosis, Ethemi leads a healthy, active life and has learnt to live with diabetes. He would give this advice to someone with a new diagnosis of the disease: "Accept diabetes as something normal, something you can live with. Take care of your health by exercising and watching your diet carefully. Find a good doctor and cooperate with her or him to help you with your treatment and share new information and new studies about diabetes." Ethemi's advice to take care of your health through exercising and eating healthily is relevant to everyone, not just those with diabetes. While people living with diabetes can successfully manage the disease by creating and adhering to a treatment plan in cooperation with medical professionals, it is important to remember that type 2 diabetes is a preventable disease. At least 20% of cases of type 2 diabetes are avoidable, and making lifestyle changes can help prevent or delay the onset of the disease. For World Health Day, WHO/Europe and the countries of the Region are spreading the message: Eat healthy – Be active – Follow medical advice – Beat diabetes.